Today’s red velvet cupcakes are from an episode of Throwdown with Bobby Flay, and they are my favorite so far. They are moist, bright red, and don’t have too much cocoa powder to muck up the true flavor of “red velvet” which is not chocolate and in my opinion, kind of falls into a category of its own. 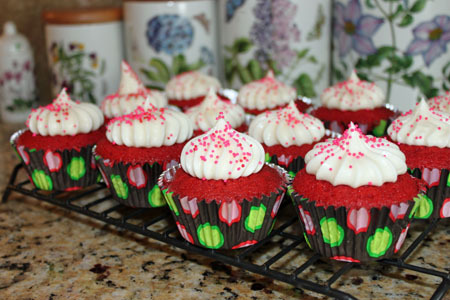 In addition, the frosting on the Throwdown red velvet cupcakes is awesome. However, you’re going to have some left over if you don’t scale it down. Here’s a link to the original recipe from the show, and below is my adapted half batch version. I added the volume measurements since the original is given in weights. Also, the Throwdown Red Velvet Cupcakes recipe says it makes sixteen, but I halved the recipe and got 14 cupcakes so I guess the Throwdown competitors made them “jumbo”. UPDATE: I didn’t realize there was a Throwdown cookbook, but the cupcake recipe is in it as well. Looks like a good book. ANOTHER UPDATE: I had Todd do a taste test between these and the McCormick Cupcakes. He chose the McCormick recipe saying it tasted sweeter. Preheat oven 350 degrees F. Line 14 cupcake cups with paper liners. With an electric mixer, beat oil, sugar, and buttermilk until combined. Add eggs, food coloring, vinegar, vanilla and water and mix well. Add the dry ingredients a little bit at a time and mix by hand until well mixed. Scoop the batter into the liners dividing evenly (a little over halfway full) and bake at 350 degrees F for 20 minutes or until the toothpick comes out clean. Let cool. For the cream cheese frosting: Whip the butter and cream cheese together in a mixer fitted with a paddle attachment until creamed. Gradually add powdered sugar to the mixture and scrape down the bowl as needed. Add the vanilla and mix until combined. I love those liners! I made some red velvet cupcakes last night (from a recipe that starts with a boxed mix). I used heart papers — was so bummed that the hearts disappeared when the cupcakes baked. This is so perfect! I just tried it yesterday and my friends really love these. I am just shame of how I decorated my cupcakes. LOL. I am really not a great cupcake decorator but they really love how it tasted. Thanks for the recipe. I love the color. I think I should make some booth for our J’s prom with these cupcakes. I am sure that my booth will be great with these. Thanks for the idea. omgosh i made these for hubbys b-day last year? or the year before? oh well i’m too old to remember. they were a hit though. i love throwdown. you & i should go on there with our super-duper cookies. LOL We’d totally win. Tina, I’m sure the McCormick ones will be a hit. They do taste like chocolate, but people will recognize them as red velvet and probably won’t think too much of it. About those liners, those are the new Reynold’s Stay Brite liners. I bought a pack at the grocery store and may never go back to regular paper lines. I was debating whether or not to bake these today for our Family Fun Night at church tonight. I made the McCormick ones yesterday and they tasted like a chocolate cupcake to me. But since Todd said he like the McCormick ones better as far as tastes goes, I’ll take his word on it and stick to what I have. You can’t go wrong with chocolate cake and cream cheese frosting anyways and the kids will eat them. Have a wonderful weekend! I am making cupcakes with those exact liners! Haha. I love the color even if the taste isn’t better! These look so good! I love the traditional flavored red velvet since it reminds of the bakery where I used to work. I may have to give these a try. Last night I came to the conclusion that Red Velvet is a personal preference and perhaps even a regional thing. Katy’s pointer for the Yahoo article rather confirms the regional taste. 🙂 Perhaps Matt Lewis of BAKED,who went to the Univ. of Alabama,is catering to our Northern tastes. i am a huge red velvet fan. i’ve never had the cupcake form so i look forward to all your reviews. keep up the great work! Your cupcakes look awesome! 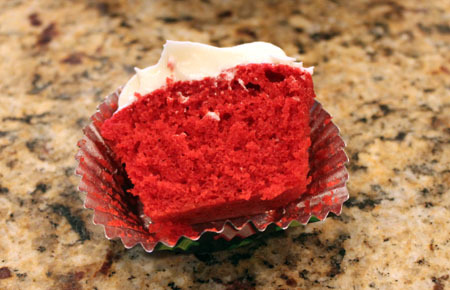 I’ve been wanted to make either red velvet cupcakes or a cake….just not sure which, but these are really cute! I love Bobby Flay’s Throwdown! Thought you’d be interested in this – it was on the Yahoo front page today, how appropriate! And those cupcakes you made are too cute!! I agree with Sue, those liners are too cute! I’ll bet if you take the McCormick’s recipe and only add 1/4 cup cocoa powder they would be more red. (Not sure how this will affect texture or anything) I like using butter rather than oil, but canola oil is definitely healthier. I will try this change and let you know what happens! Anna, I have a red velvet cupcake recipe that I’ve made a couple times now and got a big thumbs up from a huge red velvet fan. If you want another recipe for your tests (or for comparison) let me know. Your cupcakes are so cute! I love the liners you used and the way you frosted them. Throwdown is my favorite Food Network show, and I remember this episode! The cupcakes look great. I’ve never really tried the higher chocolate content red velvets, but always enjoy the traditional kind so I’m sure I’d enjoy these. You know, I’ve never had red velvet cake. It looks so pretty though! Oh YEAH!!! I am glad they turned out the best. I am going to have to keep my eye out for that cookbook! Your cupcakes look awesome and nicely decorated. Some reviewers on the Foodnetwork site thought these were oily. I guess you didn’t find that.